WASP-94 could turn into one of the most important discoveries from WASP-South. Astronomers at Keele University have found two new Jupiter-sized extra-solar planets, each orbiting one star of a binary-star system. Most known extra-solar planets orbit stars that are alone, like our Sun. Yet many stars are part of binary systems, twin stars formed from the same gas cloud. Now, for the first time, two stars of a binary system are both found to host a ``hot Jupiter'' exoplanet. The discoveries, around the stars WASP-94A and WASP-94B, were made by a team of British, Swiss and Belgian astronomers. 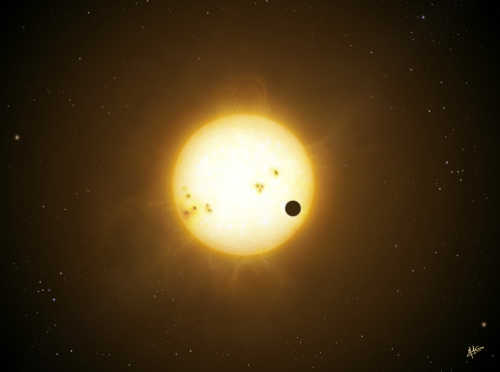 The Keele-led WASP-South survey found tiny dips in the light of WASP-94A, suggesting that a Jupiter-like planet was transiting the star; Swiss astronomers then showed the existence of planets around both WASP-94A and then its twin WASP-94B. Marion Neveu-VanMalle (Geneva Observatory), who wrote the announcement paper, explains: "We observed the other star by accident, and then found a planet around that one also!". (3) WASP planetary systems are named sequentially so WASP-94 is the 94th planetary system found. WASP-94A refers to the brighter star of the binary and WASP-94B to the fainter star. The twin stars are 180 parsecs away (600 light years) in the constellation of Microscopium. The stars were first observed by Sir John F.W. Herschel in 1834. (4) WASP is funded by the UK's Science & Technology Facilities Council. The Euler Swiss telescope is supported by the Swiss National Science Foundation. TRAPPIST is funded by the Belgian Fund for Scientific Research. (i) A WASP planet projected against (transiting) its host star. 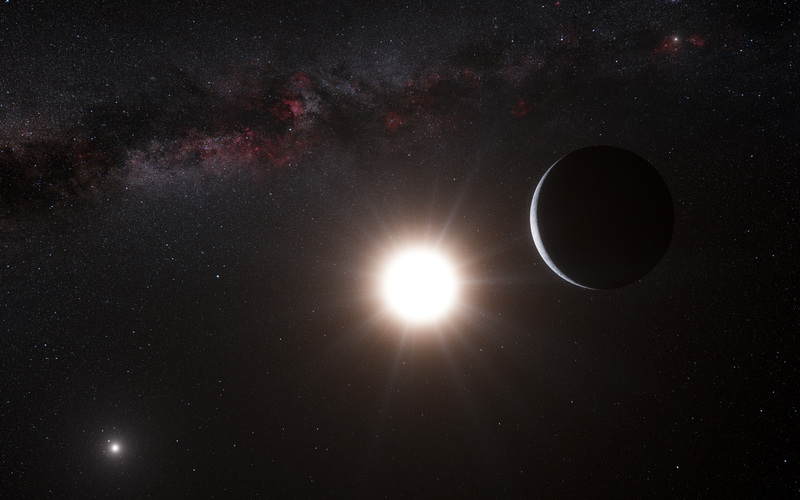 (ii) An illustration of a planet orbiting one star on a binary system. In WASP-94, the planet would transit the brighter star, causing a dip in the light that can be detected from Earth. Another planet orbits the second star at lower-left. It does not transit and is not directly visible, but it can be detected by its gravitational tug on the second star.